Shop online for over 800 plastic model ships at discounts up to 59%. Military Ships is the most popular of the 4 plastic model ships categories, then Sailing Ships, and Commercial Ships. Trumpeter is ranked #1 out of 36 plastic model ships manufacturers, followed by Tamiya, and Revell-Monogram. 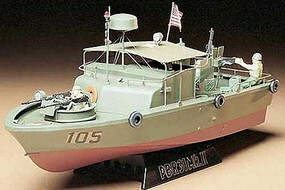 This is a 1/72 PT-109 Plastic Model Boat Kit from Revell-Monogram. It's a level 2 model boat for intermediate modelers, ages 10 and up. It was commanded by LTJG John F. Kennedy. This is a 1/96 U.S.S. 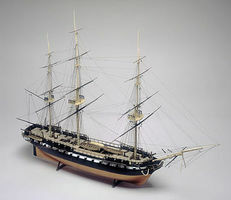 Constitution Plastic Model Ship from Revell-Monogram. It's intended for level 3 advanced modelers, ages 14 and up. This is a 1/535 USS Missouri Plastic Model Battleship Kit from Revell-Monogram. It's a level 2 model boat for intermediate modelers, ages 10 and over. This is the 1/245 Scale Landing Ship Tank (L.S.T.) Plastic Model Kit from Lindberg. Suitable for Ages 10 & Older. A blockade runner is usually a lighter-weight ship used for evading a naval blockade of a port or strait, as opposed to confronting the blockaders to break the blockade. Very often blockade running is done in order to transport cargo, for example to bring food or arms to a blockaded city. In other cases the blockade runners would carry mail in an attempt to communicate with the outside world. A 1/350 Scale Plastic U.S. Navy DD445 Fletcher Destroyer from Tamiya. 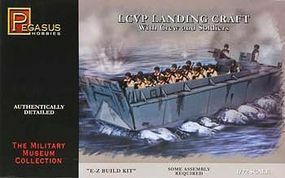 This is the 1/72 Scale Plastic Model Military Ship Kit of the LCVP Landing Craft w/Soldiers by Pegasus Hobbies. Suitable for Ages 8 & Older. Assemble the U.S. CVN-68 Nimitz Aircraft Carrier (1975) with this 1:350 Scale Plastic Model Kit from Trumpeter. Suitable for Ages 14 & Older. The Titanic! The Ship itself Sailed on her First and Final Voyage from Southampton, England on April 10, 1912. At 11:40pm on Sunday April 14th, the Ship struck and Iceberg in the North Atlantic and sank 2 hours and 40 Minutes Later. Even though there were Only 18 Lifeboats on Board Ship, 711 of the Over 2220 Passengers, were Rescued. Skill Level 2 for ages 10 to Adult, Intermediate to Advanced Modelers. Assemble the USS The Sullivans DD-537 with this 1:350 Scale Plastic Model Kit from the Trumpeter World Boat Series. Suitable for Ages 14 & Older. 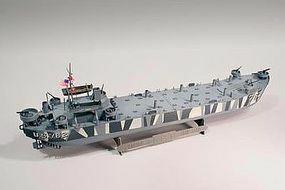 This is a 1/426 USS Arizona Plastic Model Battleship Kit from Revell-Monogram. It's a level 2 model boat for intermediate modelers, ages 10 and up. This is a 1944 USS GATO SS-212 Plastic Model Kit from Trumpeter. Suitable for Ages 14 & Older. This is a 1/350 Plastic German Battleship Bismarck from Tamiya. It's for ages 10 and up. Assemble the U.S. Aircraft Carrier CV-8 Hornet with this 1:350 Scale Plastic Model Kit from Trumpeter Scale Models. Suitable for Ages 14 & Older. Assemble a Harbour Tug Boat with this 1:108 Scale Plastic Model Kit from Revell Suitable for Ages 10 & Older. This is the 1/530 Scale U.S.S. Oriskany Plastic Model Kit from Revell. Suitable for Ages 12 & Older. This is a 1/50 Scale Viking Ship Plastic Model Kit from Revell. Skill Level 3, for Experienced Modelers. This is the 1/700 USS Gato SS-212 1944 plastic model by Hobby Boss For ages 14 years and up. The United States Navy Aircraft Carrier CVN-65 Enterprise, also known as the "Big E", is the worlds largest ship and the first nuclear powered aircraft carrier. Webster defines the word Enterprise as meaning"Undertaking, Project, A business organization, Initiative, etc. ", and the CVN-65 fits all of these definitions perfectly.